The slaying of Cecil the lion last year epitomises everything that’s wrong with a hunting culture that now seems to be more about pleasure and ego. A dentist who learned to shoot when he was five years old hops on a plane from the U.S to Africa and buys himself a baited lion which he slaughters, all for the thrill and the trophy. He doesn’t see the wondrous animal that others see. He sees only himself. Pleasure and ego doesn’t just drive trophy hunters. Over Easter, teams of hunters in New Zealand gathered in Central Otago to blast as many rabbits as they could in 24 hours – almost 10,000 perished. Intended as a cull to rid farmers of a pest, the event was much more about the thrill of killing. Worse, the Great Easter Bunny Hunt is a family day, and this is what concerns me most about the hunting culture. While some hunters kill for food and need to pass on these survival skills to the next generation, many hunt for pleasure. Children of these hunters seem to have little choice in the matter. In New Zealand, children have some protection. They can’t legally use a gun until they reach sixteen. In the U.S, younger children can legally use firearms under supervision. Understandably, there’s concern among those opposed to the right to bear arms, as well as among some gun proponents, about the safety issues surrounding children and guns. In 2015, at least 265 children caused injury or death to themselves or others from firearm use. Yet the U.S National Rifle Association seems set on lodging guns in children’s psyche, putting profit before ethics by insidiously targeting youngsters. The NRA has commissioned an author to re-write children’s classics such as Hansel and Gretel and Little Red Riding Hood, with Three Little Pigs to follow. Although purportedly showing safe gun use, the stories promote gun use in self-defence. The author defends her work, saying the fairy stories are already violent and the new versions teach children about security. But this stance seems to ignore the violence of gun use and the tragedies surrounding their use by children. The boy’s parents clearly loved him and didn’t intentionally put him at risk. “Some people are like, ‘a nine year old shouldn’t be off by himself,’ but he wasn’t an average nine year old,” said the boy’s uncle. Children are not mini adults though, however grown up they seem to be. 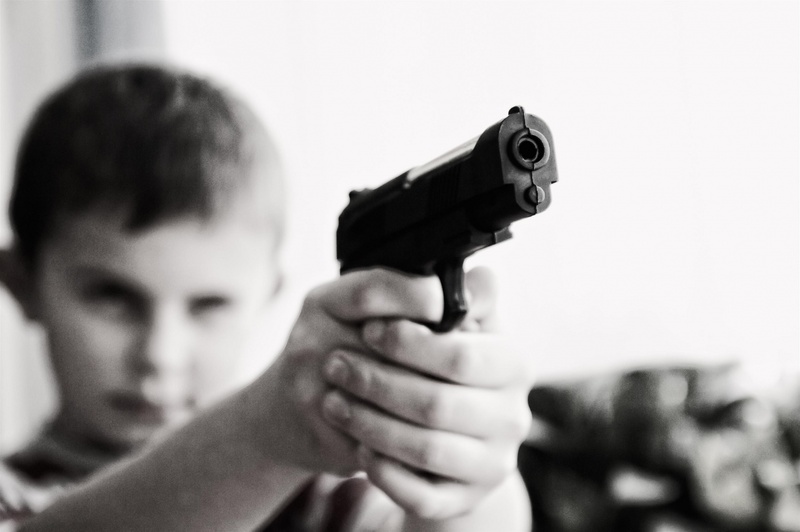 Many Americans believe it’s their parental duty to teach children to use guns. It’s a difficult viewpoint for others to understand. Yet good parenting involves protecting children from harm. Allowing children to do what we do, regardless of age, safety and moral implications, is not protecting them. Teaching his daughter to hunt has become a war veteran’s purpose in life. He has a dream that his daughter will be the “first four year old in the world to hunt and kill a hog.” It doesn’t seem to matter whether his young daughter wants to hunt. “I have to be with her for her very first kill… Can’t take that away from me, you know. It’s going to be a huge accomplishment that her dad’s a triple amputee with one arm and he’s got her to where she can hunt herself,” he says in the documentary Kids and Guns. She has already been made to watch him kill a squirrel from his wheelchair, then hold the corpse for photographs and watch the skinning. Images of children carrying guns or holding slain animals represent a corruption of childhood. Children enjoy pleasing the adults in their life, but they don’t have to kill to earn our approval, unless we make it that way. They can help to prepare food, or feed animals, or grow vegetables. We can teach them how to create and nurture. When they reach adulthood, they can choose whether or not they want to use guns and kill animals, but before then, let’s not force them down a path. Despite the increasing fatalities involving guns, the U.S shows few signs of restricting gun use, mainly due to the powerful gun lobby that blocks attempts to do so. It seems inconceivable that parents are legally required to strap toddlers into a car seat and to put seat belts on older children, yet are given the freedom to decide on their child’s safety regarding the use of firearms. Gun proponents argue that guns exist in society, so children need to be taught how to use them from an early age. Of course, we need to educate on dangers, but we don’t need to make children take part. Guns are no different to cars – both are lethal in inexperienced or irresponsible hands. Just because our children see us driving a car, doesn’t make it appropriate to show them. We must wait until they have the cognitive ability to make judgements based on visual clues and the rules they’ve learned, as well as the physical ability to drive with precision, and also common sense. Perhaps we should look more critically at why we teach children the things we do. Is it for their benefit, for society’s benefit, or our own? It’s one thing to dress our children in our favourite football team kit, although better they make their own choice, but it’s a different matter to place a gun in their hand. I’m not a hunter and neither do I live in the countryside, so I’ll likely be accused of being ignorant of rural life. I can’t understand though, why a mother would feel comfortable letting her child use a gun, or have guns in the house that aren’t locked away. Do we leave knives on the table, or poisons in unlocked cupboards, or fires unguarded? A gun is equally dangerous, yet attitudes seem casual. The focus of gun education must be on preventing accidents (by keeping firearms locked away and on safe use by adults), not on teaching children to use guns. Children are highly impressionable. Killing has no place in childhood if we want a more compassionate society. We first need to teach children to respect nature, otherwise what hope is there for preserving the natural world and for protecting humanity in the long run? A society that promotes killing isn’t a healthy one.